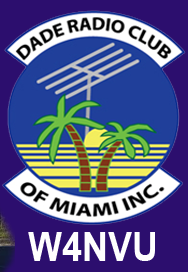 November 2011 Meeting Minutes – W4NVU – Dade Radio Club of Miami Inc.
Meeting was called to order at 19:46 with 26 present. Minutes were posted online. Steve made a motion to accept the minutes, seconded by Frank. The motion passed and the minutes were approved. Treasurer’s Report – Esther stated that we have a lot of new members. She gave the insurance forms to Miguel. Miguel has 2 lists of equipment for sale by the DRC. Miguel read the list. We are also going to have a door prize drawing of a book donated by O’Reilly Publishing. Harry won the door prize. The website is having some issues. Ryan is redoing the whole website. The information for the December 12 meeting is on there as well as the January 9th meeting. 147.000 – Merritt said it is dead. The transmitter Id’s every hour. Miguel is trying to find someone that has something else up on the tower so that we can get access and take care of it. He suggested that if we have to, we can pay someone to do it. Ray said that there is a company that has a tower climbing school and if we have enough people, they will hold the school. Eddie advised that the only people that go on the Channel 6 tower are out of Texas and they charge for 400 feet about $700.00 per hour. 147.760 – Ray said its up and running and we are using it now. Ray also spoke about our antenna that was up during Hurricane Andrew and that it is still standing. 224.200 – it still needs a home. The 1291.80 needs an oscillator and he suggested that we try to sell it. Ray discussed the antennas at UM. We need to go there when the person in charge is working on it. 51.660 – Ray stated that the transmitter is still there but it has a problem. The Miami-Dade Ares/Races Update for the month was given. The Coral Gables Races Net information was given. The Everglades Amateur Radio Club Net information was given and the Cutler Bay Races information too. Christmas Party was discussed. Miguel has flyers. You can pay Esther tonight or pay at the door. It is December 12, our meeting night, at Carino’s Italian Restaurant at 8240 NW 36 Street, Doral, FL. It starts at 7 PM and it costs $25.00 per person. We will have a quick DRC meeting and awards will be given and we will have a raffle. Mini fest was discussed. Still trying to find a place. February 4, 2012 was discussed as the date, it is the Saturday before the super bowl. We are trying to get something at Tamiami Airport. Lee suggested the German American club. It is not big, but is has an outdoor patio that is covered. Lee announced that several people passed their exams in the other room and he introduced them. Kevin Valdes, Anibal Buch, Henry Hernandez and Gustavo Lopez all passed their Technician; Kevin Smith passed his General and Otilio Chaviano upgraded to General. Congratulations to everyone! Miguel spoke with Gus at Communication City and they are donating a D-Star Repeater. He wanted to know if the club wanted it and if so, someone has to put it up. It was discussed that it could replace the 000. Carl stated that we would need a radio. Merritt said that we need to find a place to put it. Ray suggested that there is an antenna in Homestead that is VHF that is still up and could be some value to us at AT&T. Carl is going to call Frank and find out and see if it is a viable site. After a lot of discussion, a Motion was made by Merritt to accept the D-Star Repeater donation from Communication City no matter if it is VHF or UHF; seconded by Steve. A vote was taken and the motion passed. Armando discussed starting another Tech class and we need to advertise it. It was discussed that we would hold the classes on January 14, 21 and 28, 2012, which are Saturdays, from 8:30 AM – 12:00 Noon. Miguel said he would get it advertised. The ING Miami Tropical Marathon was discussed. Ben Nemser is the contact person. He is requesting our help for Sunday, January 29, 2012. Please contact Ben. The Jr Orange Bowl Parade the 2nd and 3rd of January was discussed. Everglades Ham Radio Day is December 3 & 4th at the Agricultural Center, 288 Street and SW 187 Avenue. Carl spoke about the Bike Tour for February 12 at Virginia Key to Homestead and back for the Diabetes Association. They need a coordinator. It is the same weekend as the Orlando Hamfest. He said that 14 people are needed. He listed people doing other events. He said that we need new people to get involved. You will get help. If interested, please call Carl 305-221-1779 or email him at KA4HLO@bellsouth.net. If he does not hear from anyone by tomorrow, he will turn it down. Carl announced that he is stopping at the end of the year. He will only be an advisor. The 50/50 raffle was next. Harry also won the 50/50 tonight. Armando Flores gave a very informative presentation on Physical Computing and the Arduino Platform. It was very informative and educational. Thank you Armando. Miguel thanked everyone for coming. A Motion to close the meeting was made by Esther, seconded by Joanne. Voted and passed.